100 years ago today the world went to war! We'll start with the facts and work back: it may make it all the easier to understand how World War One actually happened. The events of July and early August 1914 are a classic case of "one thing led to another" - otherwise known as the treaty alliance system. Austria-Hungary's reaction to the death of their heir (who was in any case not greatly beloved by the Emperor, Franz Josef, or his government) was three weeks in coming. Arguing that the Serbian government was implicated in the machinations of the Black Hand (whether she was or not remains unclear, but it appears unlikely), the Austro-Hungarians opted to take the opportunity to stamp its authority upon the Serbians, crushing the nationalist movement there and cementing Austria-Hungary's influence in the Balkans. It did so by issuing an ultimatum to Serbia which, in the extent of its demand that the assassins be brought to justice effectively nullified Serbia's sovereignty. Sir Edward Grey, the British Foreign Secretary, was moved to comment that he had "never before seen one State address to another independent State a document of so formidable a character." Austria-Hungary's expectation was that Serbia would reject the remarkably severe terms of the ultimatum, thereby giving her a pretext for launching a limited war against Serbia. However, Serbia had long had Slavic ties with Russia, an altogether different proposition for Austria-Hungary. Whilst not really expecting that Russia would be drawn into the dispute to any great extent other than through words of diplomatic protest, the Austro-Hungarian government sought assurances from her ally, Germany, that she would come to her aid should the unthinkable happen and Russia declared war on Austria-Hungary. Germany readily agreed, even encouraged Austria-Hungary's warlike stance. Quite why we'll come back to later. So then, we have the following remarkable sequence of events that led inexorably to the 'Great War' - a name that had been touted even before the coming of the conflict. Austria-Hungary, unsatisfied with Serbia's response to her ultimatum (which in the event was almost entirely placatory: however her jibbing over a couple of minor clauses gave Austria-Hungary her sought-after cue) declared war on Serbia on 28 July 1914. Russia, bound by treaty to Serbia, announced mobilisation of its vast army in her defence, a slow process that would take around six weeks to complete. Germany, allied to Austria-Hungary by treaty, viewed the Russian mobilisation as an act of war against Austria-Hungary, and after scant warning declared war on Russia on 1 August. Britain, allied to France by a more loosely worded treaty which placed a "moral obligation" upon her to defend France, declared war against Germany on 4 August. Her reason for entering the conflict lay in another direction: she was obligated to defend neutral Belgium by the terms of a 75-year old treaty. With Germany's invasion of Belgium on 4 August, and the Belgian King's appeal to Britain for assistance, Britain committed herself to Belgium's defence later that day. Like France, she was by extension also at war with Austria-Hungary. With Britain's entry into the war, her colonies and dominions abroad variously offered military and financial assistance, and included Australia, Canada, India, New Zealand and the Union of South Africa. United States President Woodrow Wilson declared a U.S. policy of absolute neutrality, an official stance that would last until 1917 when Germany's policy of unrestricted submarine warfare - which seriously threatened America's commercial shipping (which was in any event almost entirely directed towards the Allies led by Britain and France) - forced the U.S. to finally enter the war on 6 April 1917. Italy, although allied to both Germany and Austria-Hungary, was able to avoid entering the fray by citing a clause enabling it to evade its obligations to both. In short, Italy was committed to defend Germany and Austria-Hungary only in the event of a 'defensive' war; arguing that their actions were 'offensive' she declared instead a policy of neutrality. The following year, in May 1915, she finally joined the conflict by siding with the Allies against her two former allies. Click here for more extensive information detailing who entered the war - and when. Such were the mechanics that brought the world's major nations into the war at one time or another. It's clear from the summary above that the alliance system was as much at fault as anything in bringing about the scale of the conflict. What was intended as a strictly limited war - a brief war - between accuser and accused, Austria-Hungary and Serbia, rapidly escalated into something that was beyond the expectations of even the most warlike ministers in Berlin (and certainly Vienna, which quickly became alarmed at spiralling events in late July and sought German reassurances). It's possible to delve deeply into European history in the quest to unearth the roots of the various alliances that were at play in 1914. However, for our purposes it serves to date the origins of the core alliances back to Bismarck's renowned intrigues, as he set about creating a unified Germany from the loose assembly of German confederated states in the 1860s. Bismarck, first Prime Minister of Prussia and then Chancellor of the German Empire (once he had assembled it), set about the construction of Germany through high politics judiciously assisted by war against Austria and France. Appointed Prime Minister and Foreign Minister of Prussia by Kaiser Wilhelm I in 1862, Bismarck was consumed with a desire to achieve the creation of a German Empire out of the collection of smaller German states largely led by Austria's influence (another German-speaking nation). His first step was to oust Austria as the prime influence among these German states. He achieved this by engineering war with Austria in 1866 over disputed territory in the duchy of Holstein (much against the wishes of his own Kaiser). The resulting war lasted just seven weeks - hence its common title 'The Seven Weeks War' - and ended with the complete dominance of the supremely efficient Prussian military. In a peace mediated by the French Emperor, Napoleon III, Bismarck extracted from Austria not only Schleswig and Holstein, but also Hanover, Hesse, Nassau and Frankfurt, creating the North German Federation. As importantly, Bismarck had successfully displaced Austria in the spheres of influence over the many small German states. Having assembled a united assembly in the north Bismarck determined to achieve the same in the south - and so unite all of the German states under the Prussian banner. How to achieve this? Bismarck resolved that war with the French, a common enemy, would attain his aims. First, he needed to engineer a credible reason for war. Thus, in 1870, Bismarck attempted to place a Hohenzollern prince on the throne in Spain. Napoleon III, fearful of the prospect of theoretical war on two fronts - for the Hohenzollern prince was a relative of Kaiser Wilhelm I - objected. Bismarck turned up the diplomatic heat by releasing, on 14 July 1870, a doctored version of a telegram ostensibly from the Kaiser to Bismarck himself, called the Ems Telegram. The effect of the telegram was to simultaneously insult both France and Prussia over their inability to resolve the dispute over the Spanish throne. Napoleon III, facing civil revolt at home over quite unrelated matters, and receiving encouraging noises from his military commanders, responded by declaring war against Prussia five days later, on 19 July 1870. Once again, as was the case against Austria, the Prussian military machine demolished the French forces. 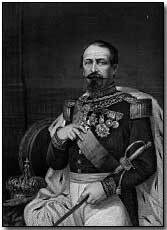 Napoleon III, who personally led his forces at the lost Battle of Sedan, surrendered and was deposed in the civil war that boiled over in France, resulting in the Third French Republic. Meantime the Prussian forces laid siege to Paris between September 1870 and January 1871, starving the city into surrender. The consequences of the war were numerous. Aside from the usual territorial gains - France ceded both Alsace and Lorraine to Prussia and was forced to pay swingeing reparations (equivalent to around $1 billion today) - the southern German states agreed to an alliance with their northern counterparts, resulting in the creation of Bismarck's cherished German Empire. Bismarck's creation of a unified Germany was of direct relevance to the outbreak of war some 43 years later, since it resulted in the assembly of the key alliances that later came into play. For, having achieved his life's aim, Bismarck's expansionary plans were at an end. He had secured what he wanted, and his chief desire now was to maintain its stability. He therefore set about building European alliances aimed at protecting Germany from potentially threatening quarters. He was acutely aware that the French were itching to revenge their defeat at the earliest opportunity - and the loss of Alsace and Lorraine to Prussia would prove to be a lasting sore. Indeed, the French plan for war in 1914, Plan XVII, was largely based around the recapture of Alsace and Lorraine in the shortest possible time - with disastrous consequences. Bismarck did not initially fear an alliance between France and Britain, for the latter was at that time in the midst of a self-declared 1870s policy of "splendid isolation", choosing to stay above continental European politics. If not Britain then, how about Russia and, conceivably, beaten foe Austria-Hungary? He began by negotiating, in 1873, the Three Emperors League, which tied Germany, Austria-Hungary and Russia to each other's aid in time of war. This however only lasted until Russia's withdrawal five years later in 1878, leaving Bismarck with a new Dual Alliance with Austria-Hungary in 1879. This latter treaty promised aid to each other in the event of an attack by Russia, or if Russia aided another power at war with either Germany or Austria-Hungary. Should either nation be attacked by another power, e.g. France, they were to remain - at the very least - benevolently neutral. This alliance, unlike others, endured until war in 1914. It was this clause that Austria-Hungary invoked in calling Germany to her aid against Russian support for Serbia (who in turn was protected by treaty with Russia). Two years after Germany and Austria-Hungary concluded their agreement, Italy was brought into the fold with the signing of the Triple Alliance in 1881. Under the provisions of this treaty, Germany and Austria-Hungary promised to assist Italy if she were attacked by France, and vice versa: Italy was bound to lend aid to Germany or Austria-Hungary if France declared war against either. Additionally, should any signatory find itself at war with two powers (or more), the other two were to provide military assistance. Finally, should any of the three determine to launch a 'preventative' war (a euphemism if ever there was one), the others would remain neutral. One of the chief aims of the Triple Alliance was to prevent Italy from declaring war against Austria-Hungary, towards whom the Italians were in dispute over territorial matters. In the event the Triple Alliance was essentially meaningless, for Italy subsequently negotiated a secret treaty with France, under which Italy would remain neutral should Germany attack France - which in the event transpired. In 1914 Italy declared that Germany's war against France was an 'aggressive' one and so entitled Italy to claim neutrality. A year later, in 1915, Italy did enter the First World War, as an ally of Britain, France and Russia. Austria-Hungary signed an alliance with Romania in 1883, negotiated by Germany, although in the event Romania - after starting World War One as a neutral - eventually joined in with the Allies; as such Austria-Hungary's treaty with Romania was of no actual significance. Potentially of greater importance - although it was allowed to lapse three years after its signature - Bismarck, in 1887, agreed to a so-called Reinsurance Treaty with Russia. This document stated that both powers would remain neutral if either were involved in a war with a third (be it offensive or defensive). However, should that third power transpire to be France, Russia would not be obliged to provide assistance to Germany (as was the case of Germany if Russia found itself at war with Austria-Hungary). Bismarck's intention was to avoid the possibility of a two-front war against both France and Russia. A decidedly tangled mesh of alliances; but the Russian Tsar, Nicholas II, allowed the Reinsurance Treaty to lapse in 1890 (the same year the new German Kaiser, Wilhelm II, brought about the dismissal of his veteran Chancellor, Bismarck). The year after the Reinsurance Treaty lapsed Russia allied itself with France. Both powers agreed to consult with the other should either find itself at war with any other nation, or if indeed the stability of Europe was threatened. This rather loosely worded agreement was solidified in 1892 with the Franco-Russian Military Convention, aimed specifically at counteracting the potential threat posed by the Triple Alliance of Germany, Austria-Hungary and Italy. In short, should France or Russia be attacked by one of the Triple Alliance signatories - or even should a Triple Alliance power mobilise against either (where to mobilise meant simply placing a nation on a war footing preparatory to the declaration of hostilities), the other power would provide military assistance. Meanwhile, Britain was awaking to the emergence of Germany as a great European power - and a colonial power at that. 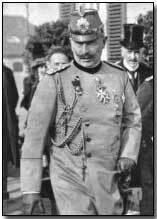 Kaiser Wilhelm's successor, Wilhelm II, proved far more ambitious in establishing "a place in the sun" for Germany. With the effective dismissal of Bismarck the new Kaiser was determined to establish Germany as a great colonial power in the pacific and, most notably, in Africa. Wilhelm, encouraged by naval minister Tirpitz, embarked upon a massive shipbuilding exercise intended to produce a naval fleet the equal of Britain's, unarguably by far and away the world's largest. She also responded by commissioning a build-up in her own naval strength, determined to outstrip Germany. In this she succeeded, building in just 14 months - a record - the enormous Dreadnought battleship, completed in December 1906. By the time war was declared in 1914 Germany could muster 29 battleships, Britain 49. Despite her success in the naval race, Germany's ambitions succeeded at the very least in pulling Britain into the European alliance system - and, it has been argued, brought war that much closer. Two years later Britain signed the Entente Cordiale with France. This 1904 agreement finally resolved numerous leftover colonial squabbles. More significantly, although it did not commit either to the other's military aid in time of war, it did offer closer diplomatic co-operation generally. Three years on, in 1907, Russia formed what became known as the Triple Entente (which lasted until World War One) by signing an agreement with Britain, the Anglo-Russian Entente. Together the two agreements formed the three-fold alliance that lasted and effectively bound each to the other right up till the outbreak of world war just seven years later. Again, although the two Entente agreements were not militarily binding in any way, they did place a "moral obligation" upon the signatories to aid each other in time of war. It was chiefly this moral obligation that drew Britain into the war in defence of France, although the British pretext was actually the terms of the largely forgotten 1839 Treaty of London that committed the British to defend Belgian neutrality (discarded by the Germans as "a scrap of paper" in 1914, when they asked Britain to ignore it). In 1912 Britain and France did however conclude a military agreement, the Anglo-French Naval Convention, which promised British protection of France's coastline from German naval attack, and French defence of the Suez Canal. Such were the alliances between the major continental players. There were other, smaller alliances too - such as Russia's pledge to protect Serbia, and Britain's agreement to defend Belgian neutrality - and each served its part in drawing each nation into the coming great war. In the interim however, there were a number of 'minor' conflicts that helped to stir emotions in the years immediately preceding 1914, and which gave certain nations more stake than others in entering the world war. Ever since Russia declined Japan's offer in 1903 for each to recognise the other's interests in Manchuria and Korea, trouble was looming. The Japanese launched a successful attack upon Russian warships in Korea, at Inchon, and in Port Arthur, China. This was followed by a land invasion of both disputed territories of Korea and Manchuria in 1904. Among other set-pieces, the Japanese astonished the western powers by destroying the entire Russian fleet at the Battle of Tsushima (27-28 May 1905) for the loss of two torpedo boats - a humiliating Russian defeat. 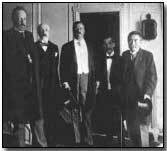 The U.S. President, Theodore Roosevelt, mediated a peace agreement between Japan and Russia, one that resulted in material gains for Japan and with note being taken in Berlin of the fallacy of the myth of Russian "invincibility". The scale of Russia's defeat in part contributed to the attempted Russian Revolution of 1905, and the battered and shaken Tsar, Nicholas II, was determined to restore Russian prestige (not least in the Romanov dynasty itself): and what better way to achieve this than through military conquest? Strife in the Balkans was nothing new. In 1912 it continued with war between Italy and Turkey, over the latter's African possessions. Turkey lost and was forced to hand over Libya, Rhodes and the Dodecanese Islands to the Italians. Turkey's troubles were not yet over. Having concluded peace with the Italians it found itself engulfed in war with no fewer than four small nations over the possession of Balkan territories: Greece, Serbia and Bulgaria - and later Montenegro. The intervention of the larger European powers brought about an end to this the First Balkan War of 1912-13. Again Turkey lost out, shedding Crete and all of its European possessions. Later in the 1913, conflict erupted again in the Balkans, as Bulgaria, unsatisfied with its earlier spoils, fought with its recent allies in an attempt to control a greater part of Macedonia; and when the so-named "Young Turks" - Turkish army officers - denounced the earlier peace as unfair. Between May and July 1913 Bulgaria's former allies beat back the new aggressor, Bulgaria, and Romania captured the Bulgarian capital Sofia in August. Beaten and having surrendered on 10 August 1913, Bulgaria also lost Adrianople back to Turkey. Despite the re-establishment of peace in the Balkans, nothing had really been settled and tensions remained high. The numerous small nations that had found themselves under Turkish or Austro-Hungarian rule for many years stirred themselves in nationalistic fervour. Yet while these Balkan nations sought their own individual voice and self-determination, they were nevertheless united in identifying themselves as pan-Slavic peoples, with Russia as their chief ally. The latter was keen to encourage this belief in the Russian people as the Slav's natural protectors, for aside from a genuine emotional attachment, it was a means by which Russia could regain a degree of lost prestige. Come 1914, trouble was not restricted to the smaller nations outlined above. The Austro-Hungarian empire was directly impacted by troubles in the Balkans and, under the ageing Emperor Franz Josef, was patently struggling to maintain coherence of the various diametrically opposed ethnic groups which fell under the Austro-Hungarian umbrella. As such, the assassination of Franz Ferdinand by the Serbian nationalist secret society, the Black Hand, provided the Austro-Hungarian government with a golden opportunity to stamp its authority over the region. Russia, ally of the Slavs - and therefore of Serbia - had been struggling to hold back full-scale revolution ever since the Japanese military disaster of 1905. In 1914, while the Tsar himself was reluctant, his government saw war with Austria-Hungary as an opportunity to restore social order - which indeed it did, at least until the continuation of repeated Russian military setbacks, Rasputin's intrigue at court and food shortages combined to bring about the long-threatened total revolution (which, encouraged by Germany, brought about Russia's withdrawal from the war in 1917). Then there is France. Almost immediately following her defeat by Prussia in the Franco-Prussian War of 1870-71, together with the humiliating annexation by the newly unified Germany of the coal-rich territories of Alsace and Lorraine, the French government and military alike were united in thirsting for revenge. To this end the French devised a strategy for a vengeful war upon Germany, Plan XVII, whose chief aim was the defeat of Germany and the restoration of Alsace and Lorraine. The plan was fatally flawed, and relied to an untenable extent upon the "élan" which was believed to form an integral part of the French army - an irresistible force that would sweep over its enemies. As for Germany, she was unsettled socially and militarily. The 1912 Reichstag elections had resulted in the election of no fewer than 110 socialist deputies, making Chancellor Bethmann-Hollweg's task in liaising between the Reichstag and the autocratic Wilhelm, not to mention the rigidly right-wing military high command, next to impossible. Bethmann Hollweg, who became most despondent, came to believe that Germany's only hope of avoiding civil unrest sooner rather than later lay in war: preferably a short, sharp war, although he did not rule out a European-wide conflict if it resolved Germany's social and political woes. This outlook on life fuelled his decision of 6 July 1914 - whilst the Austro-Hungarian government was weighing its options with regard to Serbia - to offer the former what has been commonly referred to as "a blank cheque"; that is, an unconditional guarantee of support for Austria-Hungary no matter what she decided. Germany's military unsettlement arose in the sense that Kaiser Wilhelm II was finding himself largely frustrated in his desire to carve out a grand imperial role for Germany. Whilst he desired "a place in the sun", he found that all of the bright areas had been already snapped up by the other colonial powers, leaving him only with a place in the shade. Not that Wilhelm II was keen upon a grand war. Rather, he failed to foresee the consequences of his military posturing, his determination to construct both land and naval forces the equivalent - and better - than those of Britain and France (with varying success). However his government and his military commanders assuredly did anticipate what was to come. A plan to take on both Russia and France, a war on two fronts, had long been expected and taken into account. The so-called Schlieffen Plan, devised by former Army Chief of Staff Alfred von Schlieffen, had been carefully crafted to deal with a two-front war scenario. The plan, which very nearly succeeded, outlined a plan to conquer France, to knock her out of the war, on a 'Western Front', within five weeks - before, the Germans calculated, Russia could effectively mobilise for war on the 'Eastern Front' (which they estimated would take six weeks). It is often speculated - and argued - that the plan would have succeeded but for the decision of the then-German Chief of Staff in 1914, Helmuth von Moltke, to authorise a critical deviation from the plan that, it is believed, stemmed from a lack of nerve, and crucially slowed the path towards Paris - with fatal consequences (and which ended in static trench warfare). Still, the German plan took no real account of Britain's entry into the war. The German government gave no credence to the possibility that Britain would ignore her own commercial interests (which were presumably best served by staying aloof from the conflict and maintaining her all-important commercial trading routes), and would instead uphold her ancient treaty of obligation to recover violated Belgian neutrality. For a fuller explanation of the powers' war plans, and of their upshot, click here. The British monarch George V's predecessor, Edward VII, was the German Kaiser's uncle and, via his wife's sister, uncle of the Russian Tsar as well. His niece, Alexandra, was the Tsar's wife. Edward's daughter, Maud, was the Norwegian Queen, and his niece, Ena, Queen of Spain; Marie, a further niece, was to become Queen of Romania. Despite these familial relations - nine Kings attended Edward's funeral - European politics was all about power and influence, of protection and encirclement. Thus the tangled web of alliances which sprung up in the wake of the rise of the newly united German Empire in 1871. This article has not by any means encompassed all of the suggested contributory factors that led inexorably to world war. It has however attempted to pull together the main strands: Austro-Hungarian determination to impose its will upon the Balkans; a German desire for greater power and international influence, which sparked a naval arms race with Britain, who responded by building new and greater warships, the Dreadnought; a French desire for revenge against Germany following disastrous defeat in 1871; Russia's anxiety to restore some semblance of national prestige after almost a decade of civil strife and a battering at the hands of the Japanese military in 1905.